Why I absolutely believe that You can learn to speak Mandarin Chinese by using new and proven method by using the methods taught by the RocketChinese team! First of all, if you think that to learn Mandarin or better way to call it – PuTongHua 普通话 this fast is impossible, then I have great surprise for you. I need to say this before you really start believe that you need only 5 minutes per day to speak fluently Mandarin in a month about any topic possible. Basically, you won’t. If there is a program that would do that I will already know about it. But, all I am saying that studying with the perfect learning tools, 5 minutes a day is better than nothing at all. When I was talking to my Wing Tsun master in Hong Kong, he said that a student should be happy if a teacher spends only five minutes of his time with the student. Then, its up to the student what he will do with that knowledge the teacher gives him in those five minutes. Every minute is better than nothing, but in this short chunk of time, you can get some new information to your brain. But please do not just be satisfied with it. Every single second you have the time, either walking around the city, going to lunch, waiting for a client… you need to practice what you have learned in that period of time. In fact I trully believe that even in this short time, you can always learn something new. Then, just keep practicing the whole day. When you make 5 minutes of instruction and turn in into your life for a 24 hours, you will know that you are on the right track. Do not think that 5 minutes will make you flawless speaker, because it just ain’t gonna happen! Today’s language learning methods are really improved. Over the past 20 years, there was a great development in learning how the brain works and what is the best way to learn anything really fast. If you think that buying a book and learning boring vocabulary is the way to go, I must disappoint you. Those teaching methods where you need to learn 20 new words and what they mean by just trying to remember them are over. The brain does not want to retain information that is put to your head by trying to remember it hard. The brain is capable to learn at least 5x faster if the language teaching method is fun. Who wants to be bored! I was always bored at school, where I had to listen to the teacher explaining pointless grammar that I have never used in my life. And all that I know about learning of anything is that I do not remember 97% of stuff taught at the school. I also know that what I know I learned on my own and not just because I had to, but because I wanted to. So the first point you need to understand is that no language learning program will do you any good, if you do not truly want it. Really, try to think for couple minutes. Do not be afraid to close your eyes and imagine You – speaking your Mandarin Chinese language. How does that make you feel? Why do you need to learn how to speak this ancient language? What would happen if you fail acquiring this language? I am not kidding! Visualize every possibility and if you decide that you really, truly want to speak Chinese, you will. If you will have any doubts, you will probably fail. But do not worry. Learning any language is a process. I am not saying it will be easy, you will have hard study days, but if your desire led you to this website about learning to talk Mandarin Chinese, you will succeed. For a very long time I was listening to a lot of people in my circles that I can’t learn this difficult Chinese language. Guess what. I gave up on my dream of speaking Chinese since I was 12 years old! In the meantime I learned how to speak German, than English, than a bit of Spanish and with my native Czech language I thought it is enough. But when I visited Hong Kong and met people from China the dream that was dormant in me for more than 20 years finally woke up! And I have decided to dive in to mastering this language at any cost! I spent days and night on my PC trying to find the best Chinese pdf course or ebooks, so I can take it with me anytime. I downloaded tons of Chinese audio conversation and listened while going to work. And trust me, I still have tons of materials on writing Chinese characters, self-learning books and full cell-phone with many different apps for learning Chinese language. Some of the information is great. Some was just waste of my time. Now if you have all the time in the world and do not need to hurry, you can Google up so much information on other peoples blogs, watch YouTube Chinese videos and learn everything you can digest. 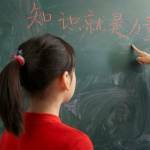 So how can you master Chinese language and speak it fluently fast? Simply, by following the Rocket Chinese program. But before you click the link and buy it, I need to tell you what it is, who is it for and if you will be able to use it. First of all this is my 100%honest review of the Rocket Chinese language system. After discovering it I was so mad that I did not find it before. They offer even 7 day free trial to test the system and you should definitely try it out before you buy. Because its so much easier. And if you really can spent only 5 minutes per day, I have to say that it need to be a quality five minutes. With this language learning program you are guaranteed that you will never waste your time. 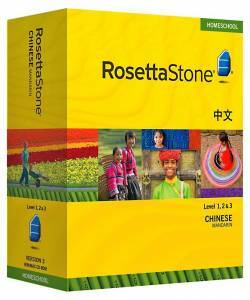 If you are interested in learning languages, you have probably heard of Rosetta Stone. I remember when I was living in the USA, there were so many commercial in TV about this program. When I returned back to my country, I recommended that program to some people thinking it will help them. After 15 days of trying, they quit. It was boring, too difficult for normal person to follow and the examples of sentences were not usable in normal conversation. So I had to get a copy of Rocket Chinese first in order to see how the lessons are structured and if the instructions are clear. When you visit their website, you will notice that the program is quite popular amongst hundreds of thousand people who studied many languages with this company. They have 7 different ways to code the Mandarin language into your brain and memory, so you will be able to communicate on very high levels. The course comes in two levels and you can either get physical CDs or you can just log in online and study everything virtually, which is my preferred method. And the best part is that by role playing and playing some fun games, you will learn so much faster and most importantly, you will remember what you have learned! 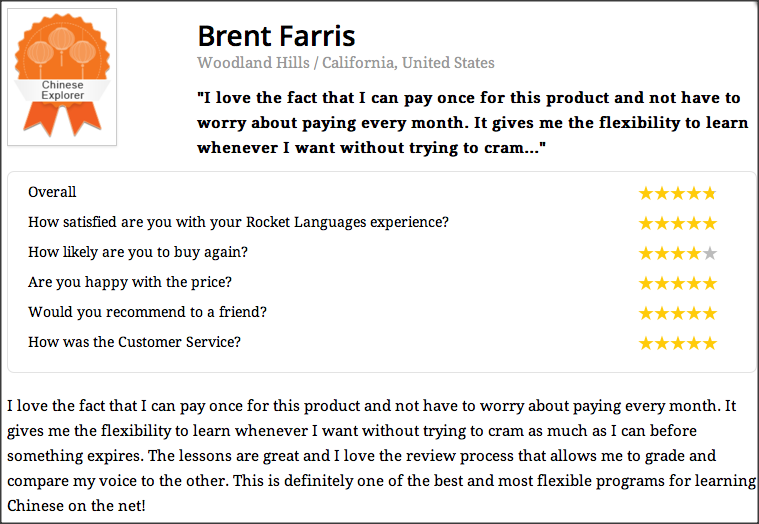 If you are curious about the 7 ways of learning to understand Chinese, make sure you visit the official Rocket Chinese webpage and make sure you check out all the testimonials. You can Google them up by yourself, I do not want to sound like a know it all person…ha ha ha! But in a nutshell – they will teach you how to segment large chunks of content and use all of the senses that will send the right signals to your brain in a very low pressured learning environment. They will make you see it, hear it, speak it and of course read and write. Because of this combination, they will guarantee you will speak Mandarin Chinese or they will give you all of your money back! Now speaking about cost of this course, you are probably wondering already how much online course like this costs. Do not worry, it is not expensive, but it is not even cheap. So How Much Does The RocketChinese Cost? Well, one of the great news is that it is much cheaper than Rosetta Stone. At $99 for a lifetime access is a steal. I sometimes pay $10-45 dollars for tutor, so this is truly a steal. I am using it as a resource or if I want a fun day learning Chinese – I log in online and study with fun. And that what is all about. If you will not have fun studying Mandarin, you better not even start. Why Is This Online Chinese Course Worth it? Well, first of all they have received Editors Choice Award of the PCMALL magazine for the best language studying tool available comparing the price and value of the course. Over 97% of their current members rated this program positively. And to remind you, just in case you forgot – they offer you money back if you find the program for learning Chinese language not useful. Also for me it’s very important that they also have phone apps, so you can be studying literally anywhere! So if you were not successful learning Chinese at group class sessions or if you do not want to waste your time and money, you should at least take the 7 Day Free Trial and see how you will like it. Just please, understand that eventhough with this language program, you have the best online instruction for Chinese that combines all the great theories in one package, its not an answer to every possible problems in language learning process. I personally use this to learn new grammar, new topic or phrase. But than I go and look for more information about the topic from many other sources. This way I turn a 5 minute lesson into 24 hours and by using various resources, I am able to make this new material stick much faster in long term memory. But for beginers, who just want to get their feet wet and start the journey of discovering Standard Chinese language, you will not be disappointed. 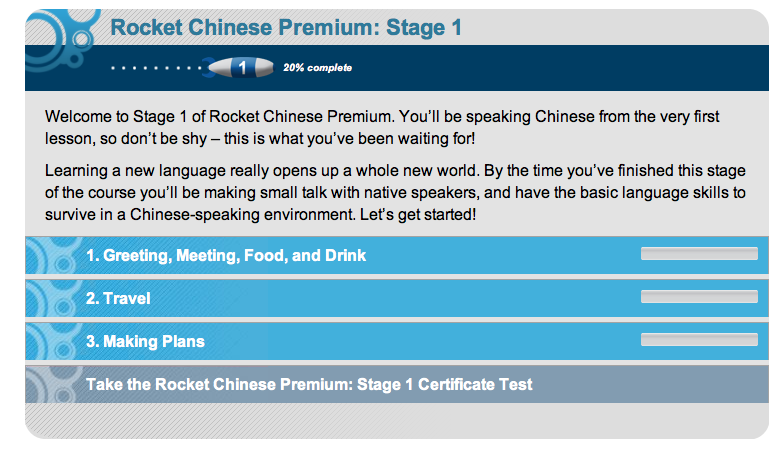 Get The 7 Day Free Trial of Rocket Mandarin Chinese Lessons Online!